I've loved words since before I could even read. As a tiny tot learning the alphabet, I would spend hours stringing random letters together hoping that I'd guessed upon an actual word in my letter jumbles. As I've gotten older, my love for words has grown into a love for the English language as a whole, along with all of its complex rules. For years, a favorite pastime of mine has been to spot the errors -- grammatical or otherwise -- in whatever I'm currently reading. Exciting hobby, right? But I admit that to help you understand what proofreading means to me. Proofreading isn't just a job for me. Uncovering those little hidden errors and making your work read as flawless as possible is a passion that I take seriously. Whether you just need a 10-page document quickly proofed or you've got a 300-page deposition that has to be finalized and perfected, my keen eye is ready and eager to be put to work. I'd love to help make your team a success. I hope to hear from you soon. 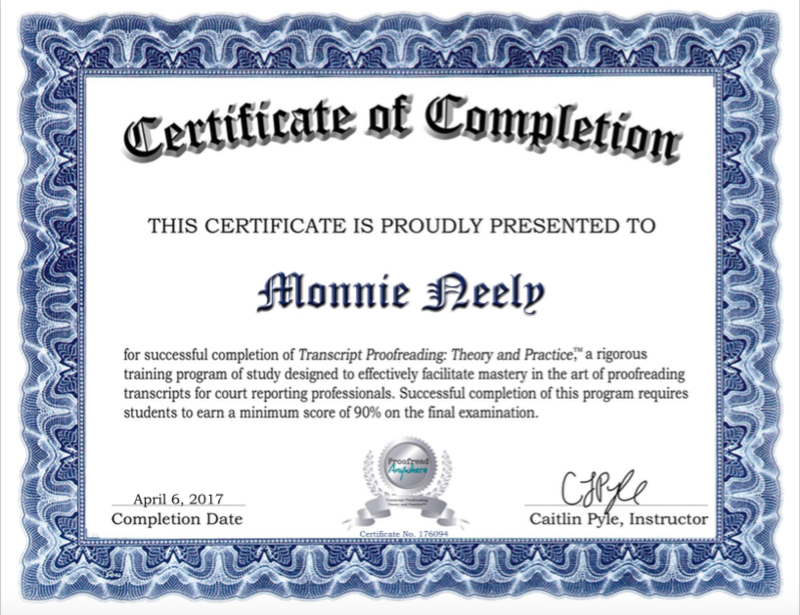 I began proofreading for court reporters in April 2017 when I graduated from the Transcript Proofreading: Theory and Practice course. Since then, I have proofread over 50,000 pages of documents ranging from depositions, hearings, trials, and examinations under oath. I use a variety of resources to do my job, including Morson's English Guide for Court Reporters, Margie Wakeman Wells's Court Reporting: Bad Grammar/Good Punctuation, The Gregg Reference Manual, and NCRA guidelines. I will use all of these resources, along with online legal dictionaries and Google, to aid me in proofreading your work. I understand that while much of the rules in the world of punctuation remain constant, court reporters can and do have their own preferences for those rules which are more fluid. Let me know if you have a preference of resources to use (Morson's, MWW, or Gregg), and I will use that as my guide in making your transcript as clean as possible. I also provide a preference sheet of the more common punctuation differences found in legal transcripts, but it is by no means necessary to fill out; I have found it just as easy to understand a court reporter's style just by knowing which resources they prefer and learning it as I read their work. I typically proofread transcripts on PDF; if you're not familiar with how to convert a file to PDF, CutePDF offers a free and easy way to do so. It's important to me to make your work look as perfect as if you'd proofed it yourself and to do so with minimal hassle and inconvenience to you. **My regular turnaround time is two days, but during busier times I may have to extend the turnaround time to three days; if that's the case, I will inform you when you first send me your transcript. I do not charge extra for weekends or holidays. If I receive a transcript that requires an extreme amount of corrections or that has obviously not been edited much before being sent to me, I will charge $.20 more per page for the additional time it will take me to proofread. If this is the case, I will notify you before continuing to work on the transcript to let you know the job will cost more, as well as to give you the opportunity to do additional editing on the transcript before I proofread it. Any unpaid invoices will be charged a 10 percent late fee after 30 days. Additional late fees of 10 percent will be charged each month the invoice goes unpaid thereafter. Is this your first time using my proofreading services? For all new clients, I offer a 10 percent discount on your first transcript! Like my work and want to tell your fellow court reporters all about it? To show my appreciation for your recommendation, I offer a 10 percent discount on your next transcript if you refer someone to me and they use my services.